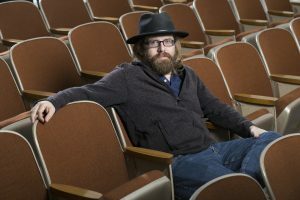 ”We could look back and say, ‘Oh, my it’s come that far in that short a time?” Yet in the last 6 years since the start of MUMfest and the frenzy of change it’s hard to argue that Aaron Rowan has definitely had a great run in a short time. Between planning events for Modesto Unplugged Music Festival/MUMfest, organizing the New Algonquin Round Table, sharing his perspective on music in AcousticView for the ModestoView, developing the Moon & Sixpence Music & Art House or presenting a great music acts from outside of the area, Aaron Rowan is a advocate for music and arts in the Modesto area. Amid the chaos, cold weather and excitement of the Christmas season, the rare opportunity to chat with Mr. Mumfest himself, Aaron Rowan, presented itself. Admittedly one of the Modesto areas most notable music promoters and enthusiast for keeping the Music scene alive, the MAMA Award–winning promoter opened up about change, the start of MUMfest and where he hopes the scene heading. The idea for Mumfest came to Rowan after attending several acoustic festivals and realizing that Modesto had nothing like that in its midst. Always intending to keep his format small, Aaron has hosted hundreds of performers since organizing shows in 2011. 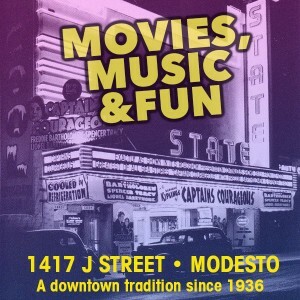 Mumfest catapulted him into the stratosphere where Modesto began to take notice as well as the musical acts. Each year the event has grown in number and instead of walking through an endless series of regular performers, Rowan has continued going after more diverse and interesting musical acts in addition to inviting back fan favorites. Anyone doubting the seriousness of Rowan’s intent has clearly had those doubts dispelled by his career as a promoter. He made his reputation by hosting some of the most talented acts in the world and won a MAMA award for his festival MUMfest in 2017. As our conversation straddles between on the record and off the record the ambiance of the room gets more lively and he manages to dig up a project that he lent his writing talent to recently, the anthology Touchstones: Life and Times of Modesto by Ken White and when learning of my passion for the project, he surprises me with a copy of the book. He mentions that he enjoys being a part of other projects aside from his regular routine and runs off into a story best suited for a memoir that explains how he is often an acting quartermaster to several of his touring musician friends. And while on the road he finds great adventures and uses the opportunity of his travels to actively scout new acts. 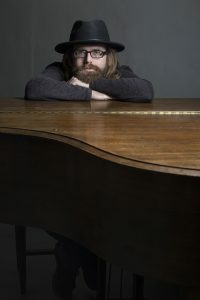 It’s hard to imagine the music scene without the contribution of Aaron Rowan and the talented folk musicians that MUMfest brings in each year. 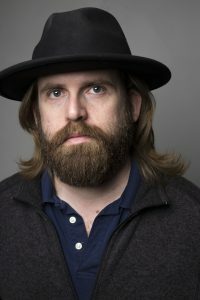 Mr. Rowan wears only one hat, but carries the role of a man with many hats through his promoting & directing the Moon & Sixpence Music and Art House, running Mumfest, touring as Quartermaster and freelance writing. 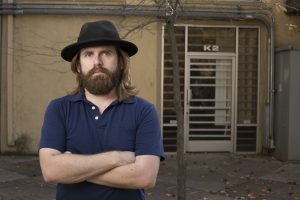 Aaron Rowan has cultivated an exceptional niche in the Modesto music community that is amazing with its ability to unite others through music, art and culture.